Have Yoga Pants Stolen All of Levi's Customers? Levi's jeans is trying to woo the ladies, but we are reportedly playing very hard to get. Women shoppers, such a tease. According to Fortune, the legacy denim brand is struggling to get humans with vaginas to wear their jeans and believe this hardship to be the fault of stretch pants. "I am very optimistic that we've nailed this," Levi Strauss CEO Chip Bergh said after the call in an interview with Fortune. "We are not afraid of yoga pants. I am on a mission to get women back into jeans." If I may speak for all humans equipped with vaginas here, the irony is that women never stopped wearing jeans—perhaps just fewer pairs of Levi's. I, for one, just adopted denim fabrics with more spandex/lycra material to accentuate my curves. Levi's never really mastered this type of cut and so they've missed out on a good amount of business, specifically mine and clearly many others. 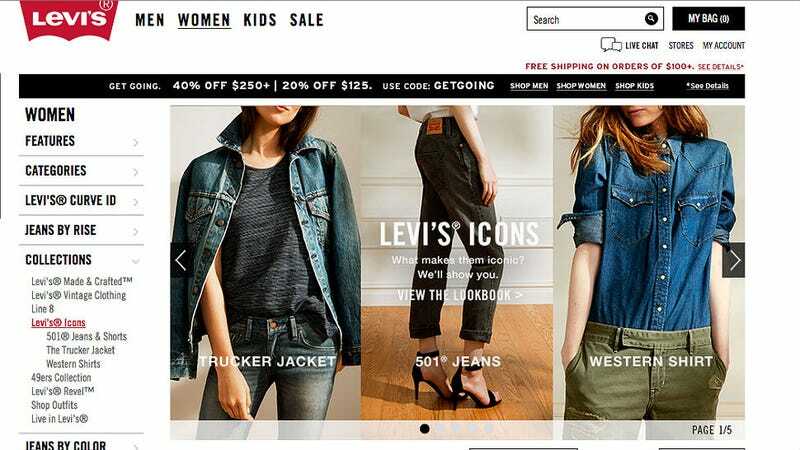 But now, the Levi Strauss CEO promises to be on trend next season and hopefully the company gets it right. Maybe they should look to the reinvigoration of fashion lines like Burberry for a note or two.